the mobile experience: As more Unlocked Phones Become Available, is the Game Changing? As more Unlocked Phones Become Available, is the Game Changing? Last week, I read about BestBuy.com to start selling HTC Touch Dual unlocked to its web customers. I went to Bestbuy.com and found a dedicated a space they are using to educate consumers about buying unlocked phones and its ability to work with different telecoms. While unlocked phones on the page are limited in quantity (18 available online at time of writing), it is still a noteworthy movement. Lately, I've noticed consumers now have more places to buy unlocked phones (ie. Amazon.com, Buy.com, MobileCity, etc.) and it may be a shift in trend and mobile knowledge for U.S. consumers. For far too long, have the U.S. mobile market been locked. We, as the consumers, were never educated about the intricate relationship between SIM Cards, GSM phones, locked or unlocked and roaming vs using other network SIM. Whilst in Asia and Europe, consumers have always known and purchased unlocked phones since the beginning. It is all part of our telecoms' master plan, by keeping things simple, subsidized and locked; it removed many unnecessary Q&As about how all of this works. Just sign on a dotted line, pay a couple of bucks for a subsidized phone and you are off to chat and text away with your friends with a contract for the next 12 months (in the beginning) and 24 months (today). When asked about traveling to foreign lands or out of network area, they tell you that roaming charge will conveniently take care of your needs. After all, why benefit the consumers with knowledge that can save money by inserting a pre-paid SIM to an unlocked phone while on international land? But going back on topic, there seems to be more unlocked phones within reach. 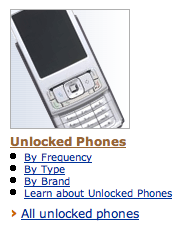 With the simple economics of supply and demand, there must be a growing demand in buying unlocked phones. All of this demand may have been heightened by the infamous AT&T iPhone debacle where people finally realized how much of a hassle it is to have a locked phone working only under a 2-year contract (new or extension) an exclusive carrier. In the interest of wanting to get an iPhone unlocked, consumers may have inadvertently learned about how phones worked or should work. Hence more interest in unlocked phones in the marketplace. of an unlocked phone w/o a contract, they will just have to pay full price for that mobile experience. Afterall, freedom is never free. PS - Anyone interested in unlocking their contracted, subsidized phone can request their carrier to provide unlocking instructions. Generally speaking, if you've been a good standing customer for more than three months, your carrier would be willing to unlock it for you, I usually explain that my traveling requirements throughout Asia is the reason why I needed my phone unlocked, and they are usually very cool about it! Interesting post... Looks like flash memory is really starting to become more popular. Hopefully we'll start seeing a drop in SSD prices real soon. $5 32 GB Micro SDs for your Nintendo DS flash card... sounds gooooood. Another advantage of our system, All sorts of user generated tips are online as well as updating a resources and help section with everything you need.